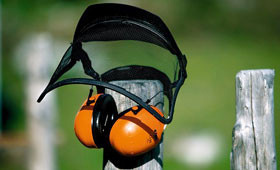 When using power tools, face and ear protection must be used and the STIHL range of face/ear safety products have been designed to meet a variety of applications. Ear protection reduces engine noise. Face protection keeps grass and twigs away from your face.